Today, 3 March is World Hearing Day. This year’s theme is ‘Action for hearing loss: make a sound investment’. Hearing loss “in Australia costs us about $12 billion a year,” says Professor David McAlpine, Macquarie University’s Director of Hearing Research at the Australian Hearing Hub. Hearing loss, which affects one in six Australians and is set to increase to one in four of the population by 2050, and has a “profound effect on people’s lives, and on the lives of those around them,” explains David. 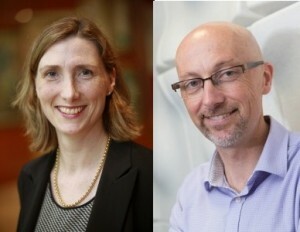 In support of the World Health Organization’s hearing loss campaign, Professor David McAlpine and Adjunct Professor Cathy Birman from Macquarie University’s Australian Hearing Hub prepared an expert video with Think GP, an online education platform for health professionals. This video has been distributed to 34,000 GPs and allied health professionals around Australia. The aim of the video is to promote awareness of hearing loss, its negative impact on people’s lives, the importance of hearing screening and solutions to health care professionals. The video discusses the prevalence of hearing loss in the community and how, if untreated, it can affect a person’s health, social and financial wellbeing. “We also suggest screening for patients who are noticing that they are hearing not as well”, explains Cathy, who says that health professionals need to be proactive about picking up hearing loss and treating it. Cathy goes on to explore some of the treatment options available that can help with improving hearing and communication, such as hearing aids, wireless devices and cochlear implants when hearing aids are not enough. David McAlpine is the Professor Hearing, Language and the Brain, and the Director of Hearing Research at Macquarie University. Associate Professor Cathy Birman is an Adjunct Professor at Macquarie University, and the Medical Director of the SCIC Cochlear Implant Program.